Looking for a new addition to your appetizer menu? 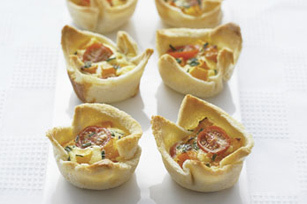 Give our Squash & Cherry Tomato Quiche Cups a try. These bite-size quiche appetizers are made with roasted squash, cherry tomatoes and fresh chives - yum! Toss squash with oil; spread onto baking sheet. Bake 15 min. or until tender. Meanwhile, flatten bread slices with rolling pin. Press 1 piece onto bottom and up side of each of 12 muffin pan cups sprayed with cooking spray. Combine squash and tomatoes; spoon into bread cups. Beat remaining ingredients with whisk until well blended; spoon over squash mixture. Bake 15 to 18 min. or until centres of filling are set and tops are golden brown. Cook 2 bacon slices; drain. Crumble bacon; add to bread cups with cooked squash mixture.